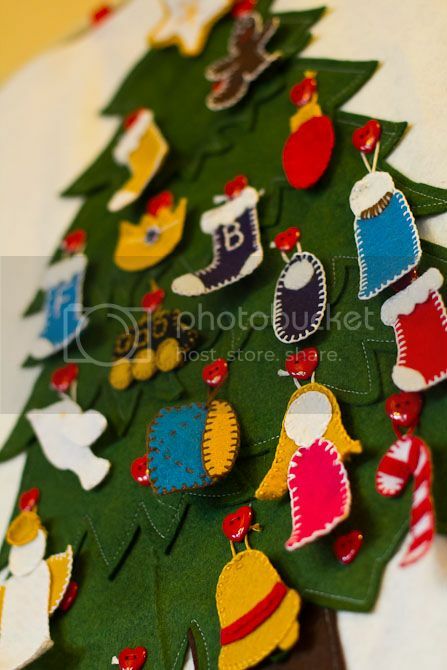 Well, I make 22 out of 25 of the ornaments for the Advent Calendar. I'm actually extremely proud of that. Do you see the Polar Express? That was a Christmas favorite around here. And do you like the star that looks like a starfish? Oh well. So I need to make 3 more in the next 340 days... or so. I think I can manage that. Finley should understand more about Christmas, so I can replace some of these with ones from the Jesse Tree so we can focus on that story. My original goal was to make nativity themed ones and steer away from commercial Christmas stuff... but I just really wasn't creative enough. This may have been my least favorite part. I did NOT like making all these numbers. Except that I made them while I watched New Girl, so they make visions of Zooey Deschanel dance through my head. You can see my favorite ornament from this angle--Joseph and his rad beard! Awesome, right? 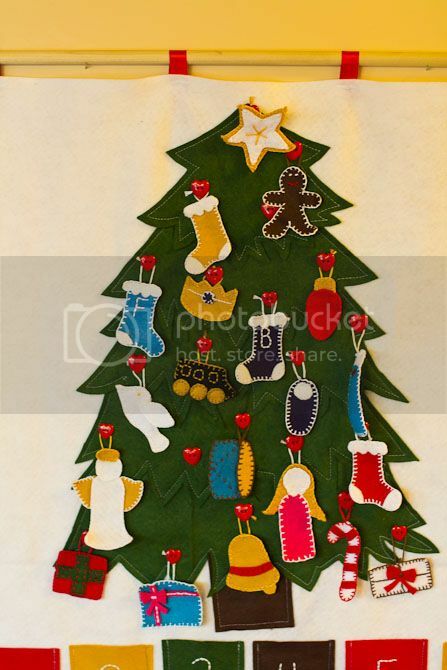 And here is the tree, naked, with just it's little buttons. Waiting for next year when we get to celebrate Jesus all over again. Don't worry, I'll remind you about this next November so you can get started early making yours. It's totally worth it. You know, if you don't mind your hands being cramped up for weeks. Apparently people hate commenting on our blogs. Good thing we've got each other. Tell your mom to write a post again sometime. Also, I only see a lady. I do NOT see Joseph. OH now I see it. Mary distracted me. This turned out so great Rachel. Making all of those ornaments had to be time consuming. I have found so many cute projects on Pinterest and just have to get going on some of them. Thanks for finding some of those projects for me! Braden is just so darn cute. I hope we get to meet him in person soon. I also love watching babies fall asleep! 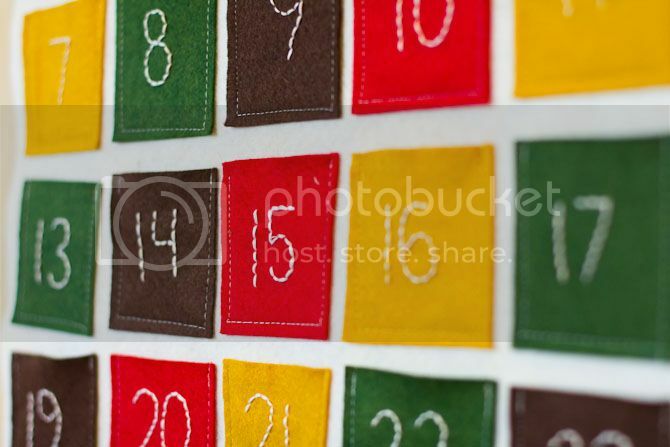 In the interest of full disclosure, last Christmas I started to make an advent calendar for my mom from a kit. Very similar detail, except with a lot of sequins. I got about 2/3 of the way through and then sent the project to my Grandma to finish. I did see it up in all its glory at my parent's this season, so at least it is getting some use. Do you have a pattern? 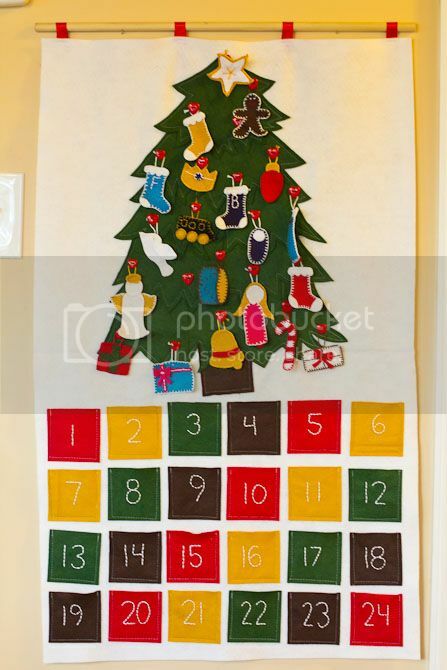 I really want to make this for our little family, but I'm not very savvy and I think I might get hung up on the tree, but I love it!!! I don't! I just kind of eyeballed it--I was surprised by how good I did! Sketch it out first? This tree is super cute!! I just saw it tonight and wish I'd seen it earlier. 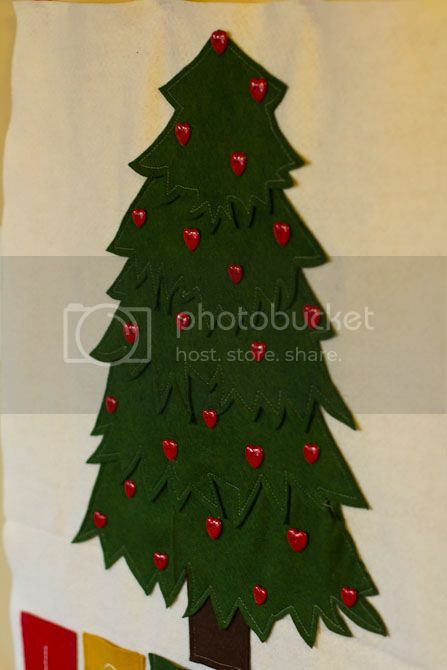 Found your tree via a link on Pinterest.